TNPSC Technical Assistant Hall Ticket 2019: We hope that all the candidates applied for the TNPSC Technical Assistant Written Test are waiting for the tnpsc.gov.in Technical Assistant Admit Card 2019. And the officials of the Tamil Nadu Public Service Commission (TNPSC) are going to release the TNPSC Technical Assistant Admit Card 2019 in the month of April 2019. Also, the TNPSC Technical Assistant Exam Date is scheduled for 20th April 2019. Moreover, the details like TNPSC Technical Assistant Selection Process are given at the bottom of the page for the sake of applicants. The direct link to download the admit card is also inserted to the end of this page. Tamil Nadu Public Service Commission is recruiting the employees for 19 Senior Technical Assistant and Junior Technical Assistant posts. Soon, after applying for the written test, the main tension for the candidates is where to get the Admit cards and knowing the TNPSC Technical Assistant Exam Date 2019. As per the notification, the exam date is scheduled on 20th April 2019. Also, the tnpsc.gov.in Technical Assistant Admit Card 2019 is released in the month of April 2019. The Selection Process for the TNPSC Technical Assistant posts is carried out completely through Written Test followed by the Personal Interview. As known, a selection committee of the Tamil Nadu Public Service Commission is responsible for the TNPSC Technical Assistant Selection Process 2019. Also, the Department of Handlooms and Textiles are involved while conducting the qualifying process. Also given the Exam Centers are Chennai, Madurai, Coimbatore. So, the candidates should prepare well for the Exam as the Exam date is released. Candidates should bring the printout of their tnpsc.gov.in Technical Assistant Admit Card 2019 in the examination hall. Similarly, Candidates should download their admit card before the date of exam. 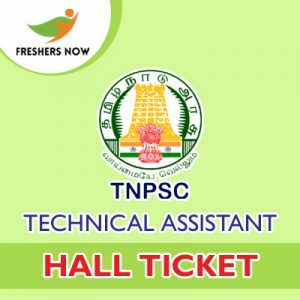 A candidate is advised to validate all the details on their TNPSC Technical Assistant Hall Ticket 2019. First, Move to the tnpsc.gov.in, the Official website of Tamil Nadu Public Service Commission. Next, refer the current news on the Home page. Then, search for the desired tnpsc.gov.in Technical Assistant Admit Card 2019 link from the live links scrolling on the Homepage. Click on it and Fill the required fields like Registration number, and password. Also, enter the Captcha asked for. Recheck for confirmation and submit the details. Finally, the TNPSC Technical Assistant Hall Ticket displays on the screen. Download it and make a copy of it for future use. Finally, hope the information given in this page is very helpful to the candidates. For more such details like TNPSC Technical Assistant Admit Card 2019, keep visiting our website Freshers Now. Moreover for any suggestions and doubts, please don’t hesitate to ask us through the comment section given below. Thank you..! !